John Arel of the University of Maine, pictured during a game in 2016, has emerged as the Black Bears' No. 1 starter and leads the staff into a three-game America East baseball series against Hartford that begins on Friday. 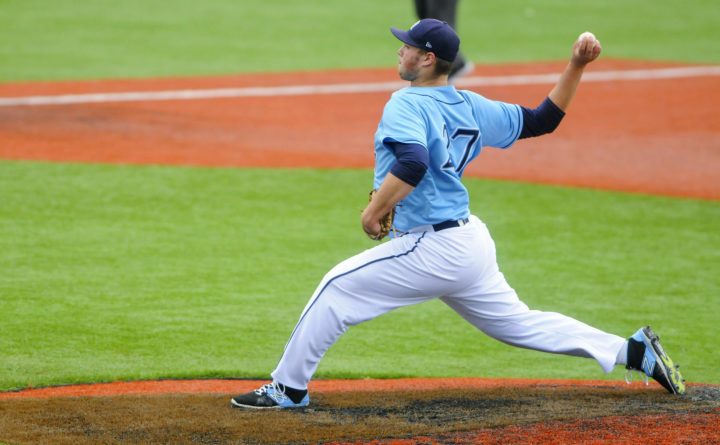 ORONO, Maine — After a forgettable junior season during which he was bothered by an arm ailment, University of Maine senior right-hander John Arel found himself in a difficult role this season. When the ace of the staff, Justin Courtney, was lost for the season with an elbow injury that required Tommy John surgery, Arel became the No. 1 starter. And he has come through. Arel goes into this week’s three-game series against America East leader Hartford with a 5-2 record and a 3.94 earned run average. He has pitched a no-hitter, but lost 1-0 to UMass Lowell. In 59 1/3 innings, he has allowed 43 hits while striking out 54 and walking 29. He has hit 12 batters. Opponents are hitting .204 against him. “There hasn’t been any extra pressure. All I can do is go out and throw. It didn’t change what I do. I just try to get guys out,“ said the 6-foot-7, 275-pound Arel, a native of Burlington, Connecticut. Arel, who features a fastball, slider and change-up, was 2-1 with a 12.13 ERA last season. He went 3-9 with a 3.94 ERA his sophomore year. He appeared in three games as a freshman. Joining Arel in the three-man rotation are two sophomores from Maine, Moscow righty Cody Laweryson and Bangor lefty Trevor DeLaite. Another pitcher expected to figure prominently in the rotation, junior Nick Silva, has been limited due to forearm tightness and he may miss the rest of the season. Laweryson was moved into the starting rotation and has made a start each of the last three weekends. He allowed one run in five innings at the University of Maryland, Baltimore County but allowed four runs in the sixth. He beat Binghamton (6-1) with 5 1/3 innings of five-hit ball, then gave up seven hits and four runs in 3 1/3 innings in an 8-5 win over Albany. “Cody has been able to give us 90 pitches and as long as he is able to do that, that’s all we can ask for,” said Derba. DeLaite has made two successive starts after hurling four innings of five-hit, two-run relief in a loss at UMBC. He went 5 2/3 innings against Binghamton (9 hits, 4 earned runs) in a 7-4 loss. Last weekend, he went four innings and gave up seven hits and four runs in an 8-7 win at Albany. “[DeLaite] needs to command his change-up. If he can do that, he’ll be able to keep guys off-balance,” Derba said. Laweryson (2-3, 4.28 ERA), has allowed 44 hits in 40 innings with 45 strikeouts and nine walks. DeLaite (1-2, 7.68 ERA) has given up 58 hits in 38 2/3 innings with 21 strikeouts and 22 walks. “I’m starting to get comfortable as a starter after being a reliever for a year and half,” said Laweryson, who was 4-2 with a 3.08 ERA in 2017 with 20 appearances, 19 in relief. DeLaite (2-3, 5.96 ERA last season in eight appearances) said his confidence has been growing as he gains more experience. “Obviously, I’ve been all over the map. … I’ve been in the starting rotation and in the bullpen and now back in the starting rotation,” said DeLaite, who has made five starts and six relief appearances. “I’m gaining confidence that I can throw every pitch for a strike, get ahead of hitters and make good two-strike pitches. DeLaite, who walked 21 in 22 2/3 innings a year ago, admitted that he tried to be “too perfect” with his pitches a year ago, trying to nibble the corners. “I learned I don’t have to try to be too perfect. I have to challenge hitters a little more. I have to throw every pitch with intent,” he said. If the trio can give the Black Bears good starts against Hartford this weekend, it can supply them with a nice boost going into the tournament, which begins on May 23.